Bikini Bottom Hospital – From SpongePedia, the biggest SpongeBob-wiki in the world! The Bikini Bottom Hospital has served a role in numerous episodes of SpongeBob and it is probably the best hospital in Bikini Bottom. The other hospital is for weenies. This hospital has been featured in over 13 episodes throughout the series. Many characters have been to the hospital, but Squidward is there most frequently. Mr. Krabs has been to the hospital a few times. SpongeBob has also been there in a few as well. The Bikini Bottom Hospital hosts a variety of Surgeons, nurses, and even actors. In All that Glitters, SpongeBob's spatula, spat, was in critical condition when someone ordered a Monster Krabby Patty and the doctor that told SpongeBob if Spat was going to be all right, turned out to be an actor searching for a role. In another episode, Mr. Krabs was in a cash coma in The Lost Mattress where Mr. Krabs' back was killing him because of his lumpy mattress so SpongeBob, Patrick, and partially Squidward decided to buy him a new mattress and throw out his old one, with all of Mr. Krabs' money in it. Mr. Krabs had to be surgically removed from the candy machine so one of the doctors could get to the Nutty Nut Bar. The Bikini Bottom Hospital has played a role in multiple other episodes too. Although the hospital first appeared in Suds it was mentioned in Boating School. 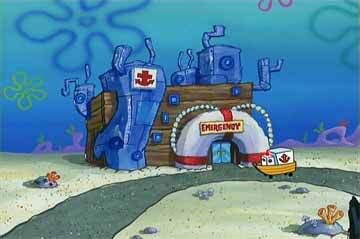 The Bikini Bottom Hospital looks like a wooden box with windows, a few downtown Bikini Bottom like buildings attached to it, half of a life saver buoy with "Emergency" in red letters, and an anchor with "Hospital" going vertical on it in the very front, there is one road that curves around the anchor, and next to the entrance with a parked ambulance, and then back around the anchor. The "Hospital" symbol is a red anchor. This is a 2008 Limited Edition Set in the LEGO SpongeBob SquarePants Series. Use the tools on SpongeBob! This page was last modified on 23 May 2018, at 05:46.